After all the buzz about Oslo going car-free a couple of weeks ago, yet another city is making the move to modernise. 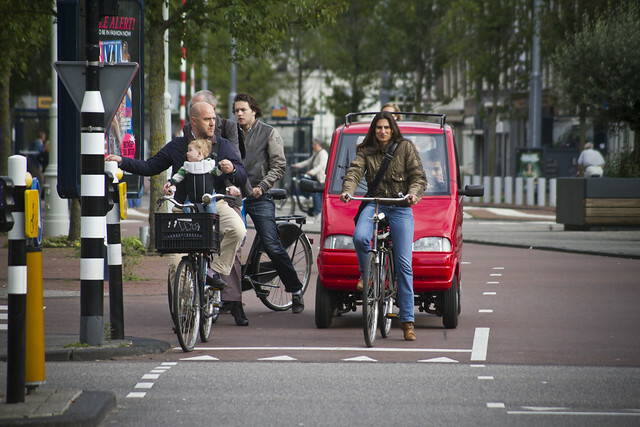 The news out of Amsterdam today is that the city council has agreed to further limit car traffic in the city centre. Earlier this year, their agreed to establish a new design for the Muntplein square. With a recent traffic study of the city, it has been established that it is possible to improve the plans even more. Through a car number plate analysis, it was possible to get a detailed picture of the traffic in the city centre. The study showed that traffic is atypical. There are many taxis, vans and visitors but there is no longer a pattern. 65% of the motorised traffic in the city city centre has no business there. 20% uses the roads to get to surrounding areas. 15% use the streets as a transit route on A to B journeys that have nothing to do with the city centre. 30% just drive around in circles - this is primarily taxis, especially at night, doing loops while waiting for customers, as well as people looking for parking. The plans will direct this parasitical traffic to other roads outside the city centre, while keeping the area accessible to local traffic and deliveries. This will improve the flow and create more space for pedestrians and cyclists. The city is also looking at how to get taxis from driving aimlessly around at night. 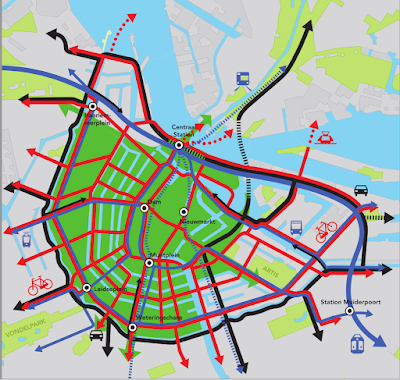 In the final design for Muntplein, cars will disappear at the end of Vijzelstraat and in an easterly direction along the Amstel River. On Singel, between Munt and Koningsplein, it will remain car-free. This is part of the City's Red Carpet programme. In order to make the end of Vijzelstraat and the last stretch of Singel completely car-free, one-way traffic will be implemented along the river between Muntplein and Blauwbrug. The municipality is in the process of working out the details and ensuring that there is still accessibility for goods delivery. 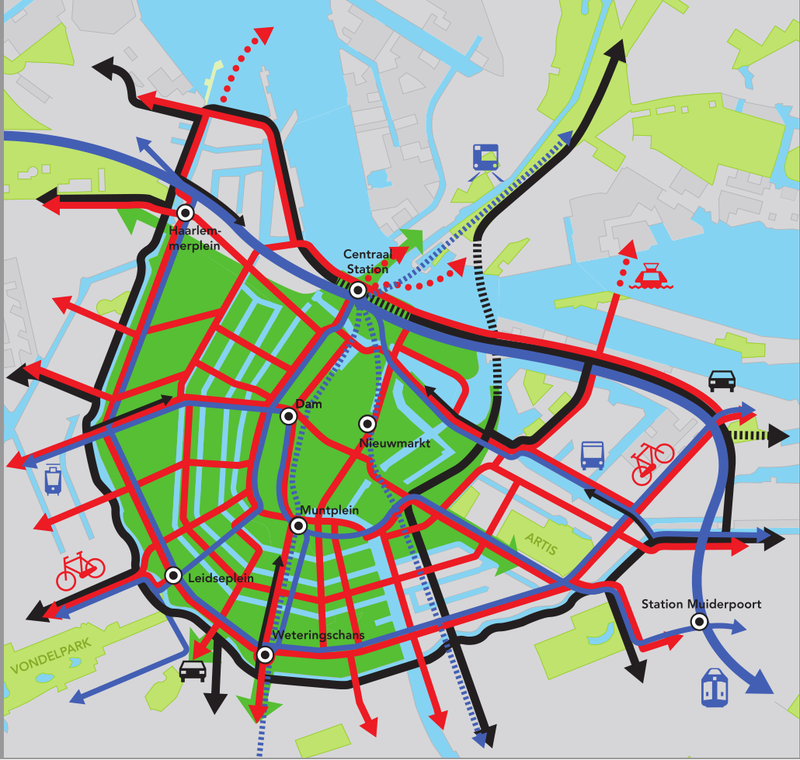 The accessibility paradigm for the City of Amsterdam. The primary goal is to reduce car traffic in the city centre by 30%. Even by rerouting traffic the city does not anticipate a deterioration in the traffic flow. Traffic coming from outside the ring still has good alternatives. Traffic on short urban trips (about 10% of journeys) will have to take frequent detours. Most of the extended travel time will be experienced by occasional visitors. The taxis of Amsterdam are the group that will experience extended travel times the most. Although it is calculated that they will spend only six more minutes of driving each week per vehicle. Residents and commercial vehicles will experience extended travel times of two and three minutes each week, respectively. The plans are expected to be carried out in 2016 and the City Council will vote on it next year, but they have - until then - agreed on it. Here is a recent article about how the city wants eight new parking garages in order to get cars off the streets and free up space for people. It could be said that the City is a bit behind schedule. There were protests and a referendum in the city back in 1992 about halving the number of cars. Some measures were implemented, however, but five years later, it was called a farce. Here is the original text from the City of Amsterdam.